The ongoing protest over the Dakota Access Pipeline near Standing Rock Indian Reservation makes for some good theater, but the protesters have as yet been unable to demonstrate that the pipeline actually trespasses on Indian lands or that it will likely lead to groundwater pollution. Both trespassing and water pollution are serious issues that would rightly open up the owners — in this case, Energy Transfer Partners — to crippling lawsuits. In North Dakota, however, the pipeline passes through private property and a likelihood of groundwater pollution has not been established. Defenders of the pipeline like to point all this out. But, those same defenders also conveniently ignore that other parts of the pipeline, including parts that pass through Iowa, rely on eminent domain to secure land rights for the pipeline owners. 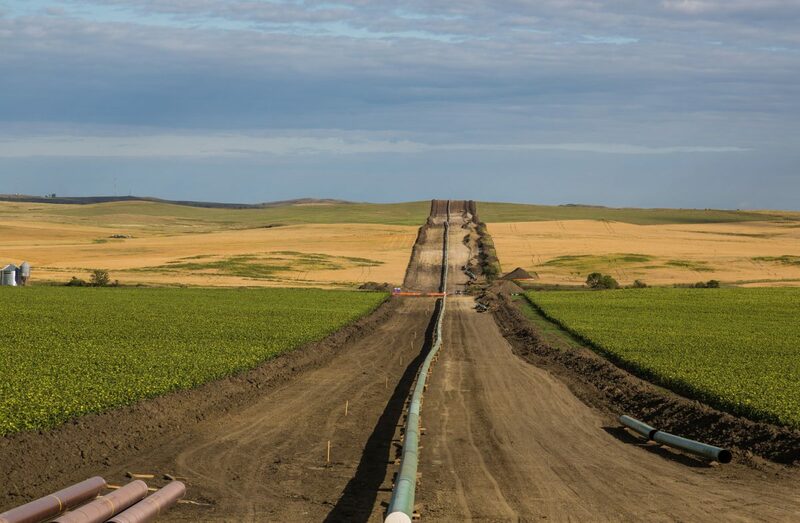 In May 2016, farmers began suing the pipeline developers in an effort to prevent the use of eminent domain to seize private property for the benefit of the pipeline owners. There are 1,295 properties along the 346-mile route through Iowa. As of November 2016, the owners of 17 parcels have sued over the fact that the State of Iowa has handed over 200 pieces of land under eminent domain laws. While the pipeline owners have attempted to obtain voluntary easements in most cases, it appears that when negotiations for easements break down the pipeline developers resort to seizing the private property via eminent domain. Moreover, the use of eminent domain calls even the “voluntary” easements into question since it is quite plausible that the pipeline developers “encourage” the granting of the easements by threatening to pursue eminent domain seizures should the land owner refuse the easement. In October, according to farmer Cyndi Coppola, pipeline developers trespassed on her farm in Calhoun County, Iowa and began digging up the topsoil for pipeline construction. Coppola was arrested on her own property for protesting the dig. In spite of the blatant violation to private property that eminent domain presents, many conservative politicians — the same ones who claim to support property rights — also support eminent domain. Indeed, during the Republican debates this year, Republican candidates expressed unwavering support for eminent domain when pressed on the topic of oil pipelines. Republicans have even begun supporting eminent domain for seizure of private lands for private uses. Historically, eminent domain was restricted (at least in theory) to public uses such as highways. The use of eminent domain for private uses, such as a Trump hotel in one case and privately-owned shopping centers in others, has long been seen as an abuse. During the Republican debate, Jeb Bush attempted to differentiate his support for eminent domain from Donald Trump’s support. Bush wrongly claimed that the Keystone Pipeline — which also relies on eminent domain — is for “public use” when the pipeline is privately owned and built to profit the owners. Trump exposed Bush’s deception, and in the process essentially demonstrated that both candidates favor the seizure of private land for someone else’s private use. The situation is no different with the Dakota Access Pipeline in Iowa. The Iowa government is attempting to seize private land and hand it over to other private owners because to do so is convenient for the pipeline owners and their supporters in government. “The state, unlike market participants, does not make its transactions through voluntary persuasion and bargaining, but through violence and the threat of violence. Certainly in the case of Eminent Domain — which means “supreme lordship” — we see that the victims of seized assets have never consented, otherwise a pure exchange could take place that requires no police power. No such coerced transaction can be said to entail “just compensation,” since compensation is only just when the party being compensated agrees to the deal. “Oftentimes, the state claims it is offering a “fair market value” for the property it seeks to seize, but this is a sham. The market price for something is, by definition, the price that both parties consent to. In a fair market exchange, each party gives up something he values less for something he values more, or else he wouldn’t agree to it. “It is only through such a voluntary transaction that we can determine what something’s market value is in the first place. Market value is not universal, but particular to the assets exchanged in a specific transaction. For any given piece of property, there can be no market value without market exchange. This article fails to mention that, unlike using eminent domain to build a road, school etc. with a pipeline, the ROW land is purchased from the owner, then after the line is installed (in most cases, such as farms and ranches) the farmer/rancher is able to continue using the land. so they get paid for their land (a fair amount or not, not my point) then they get to keep using it as they did before. Next Story Next post: Is Steve Mnuchin Just Another Wall Street Banker?